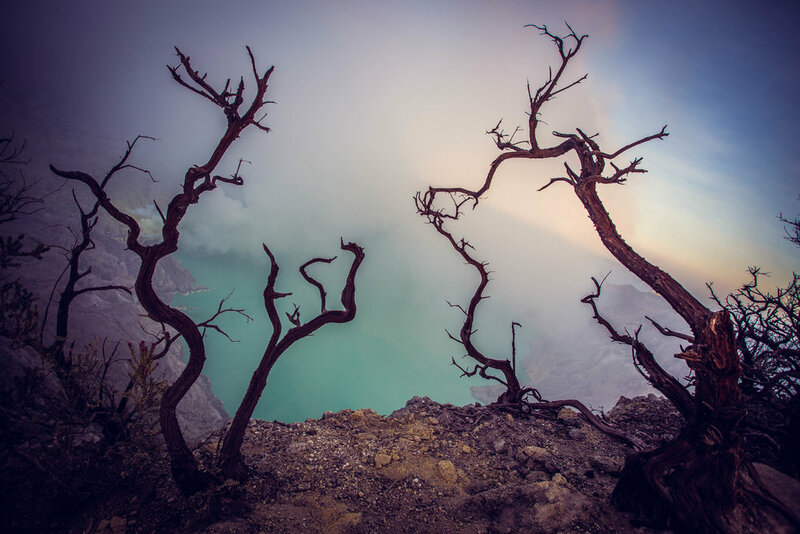 Kawa Ijen is not just merely another volcano, it is a sulfur mine that has blue flames rising out of it. These colorful flames can only be visible at night and thus, we had to begin our journey at midnight. As we had only slept around three hours, we were once again exhausted but nonetheless excited to see such a natural phenomenon. 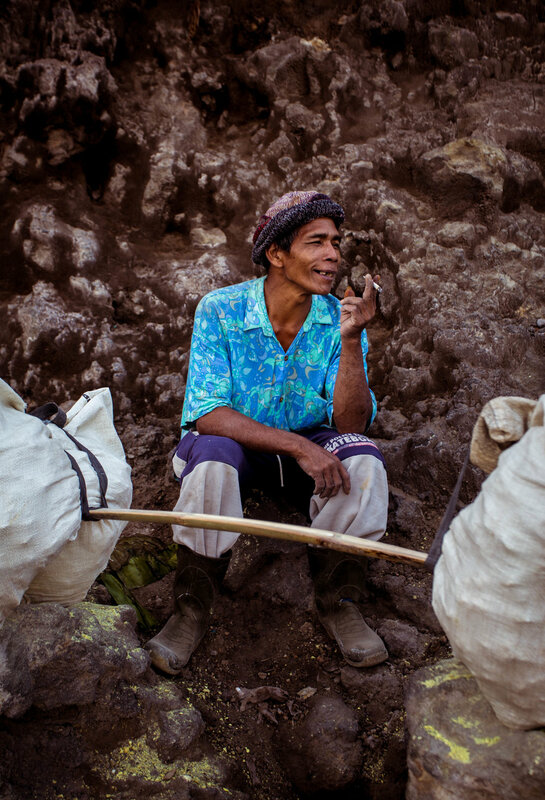 When we arrived to the parking lot/bottom of the mountain, we were met by a middle aged miner who would be our guide to the top. Actually, I am going to be honest here, the guide was actually my personal guide due to my slow pace up the steep, grueling path. Probably halfway through, his pity for me became evident as he offered me his hand and began essentially dragging me up this mountain. Yep, I held his hand for like two hours, haha, while the boys went ahead and met us up top. 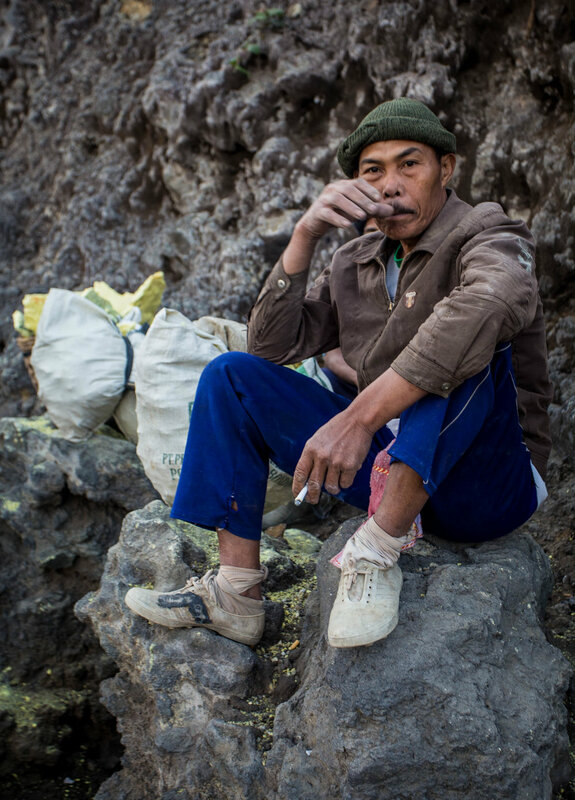 After reaching the top, the stench of the sulfur became exceedingly overwhelming. Holding the hand our guide at sunrise. Paper masks no longer cut it and we had to change to proper gas masks. 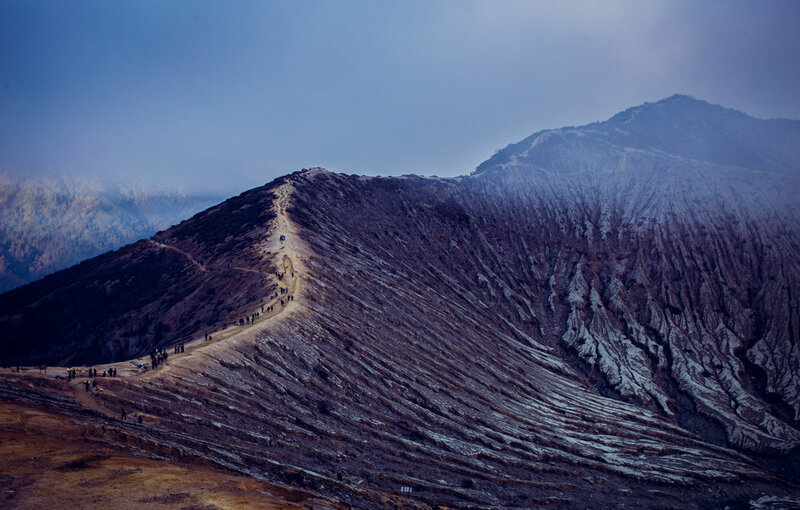 The blue flames were barely visible from the peak and thus, we asked our guide to take us down to the mining pit so we could get a closer look. 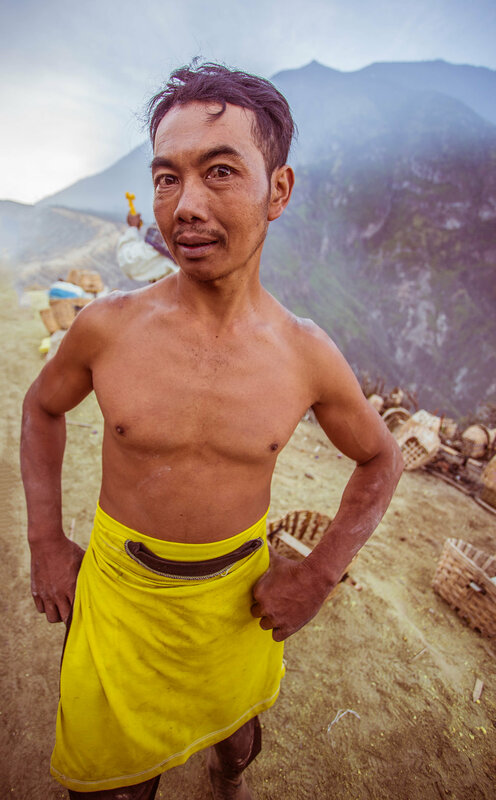 Hesitantly, our guide carefully led us down a barely lit strenuous mountain path with few safety ropes. It was slippery, dark, tedious, and extremely dangerous. 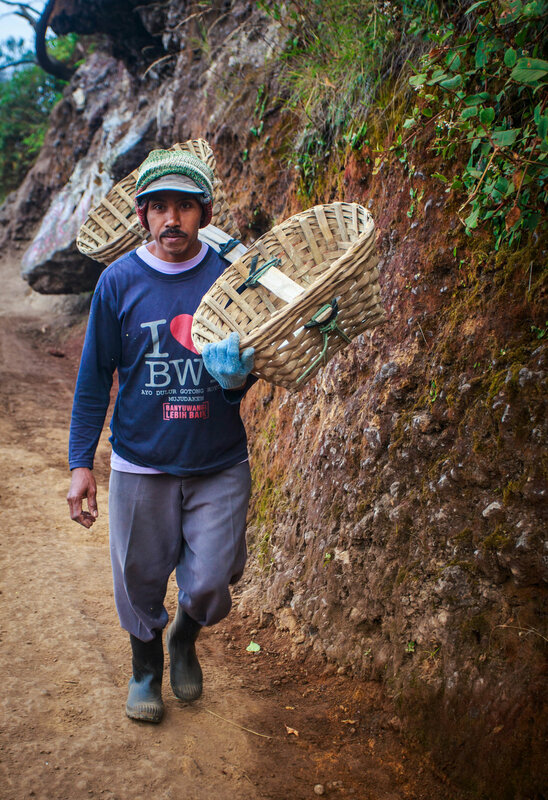 We passed a few miners carrying 80 kilo (176 lbs) baskets on their shoulders along the way. 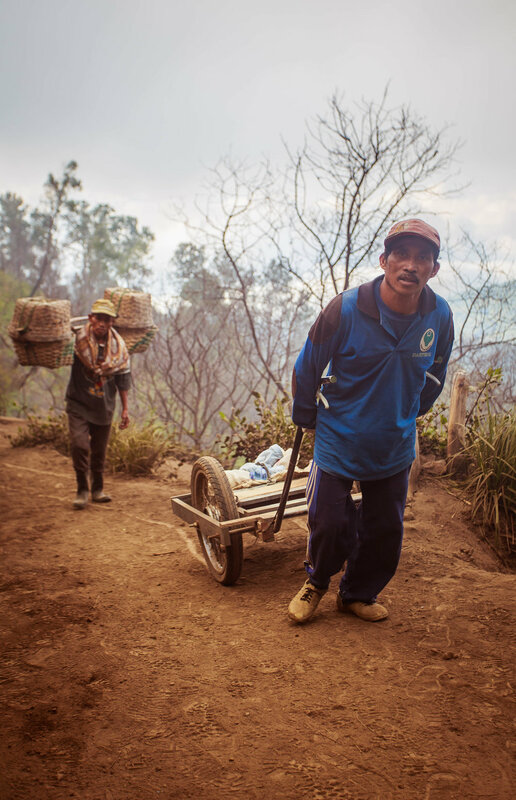 Walking down the path was so difficult and these miners not only did not wear a mask, they carried 80 kilos on their shoulders up a very dangerous path- it was shocking. When we finally reached the bottom after about thirty minutes, the volcanic smoke drafted the sulfuric stench towards us and made it increasingly difficult to even see. Squinting through the smoke, one could see miners hacking away at the sulfur. Kudos to those who actually walked closer to the blue flames as those people were able to see through the smoke, I was blinded. 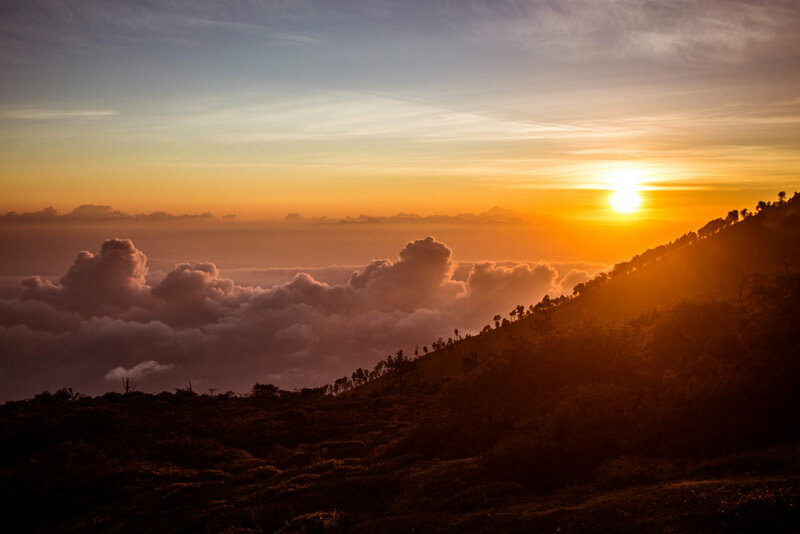 As the area became progressively crowded, we worked our way back up so we could catch the sunrise. It was another hike but well worth the view. 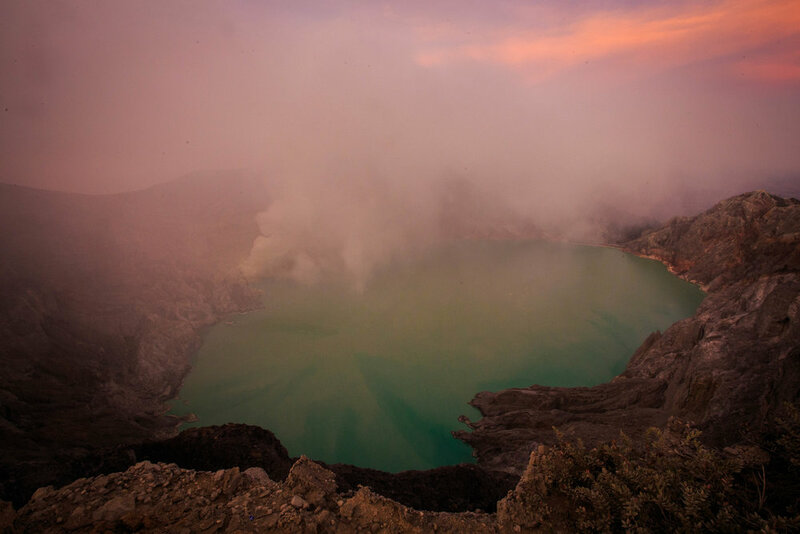 Our viewpoint for the sunrise quickly made us realize we were once again above the clouds and overlooking a vividly teal-painted sulfuric lake on one side and a mountain on the other. The walk back down was tough as the tiny gravel was quite loose and slippery so we had to be very conscious of our steps. 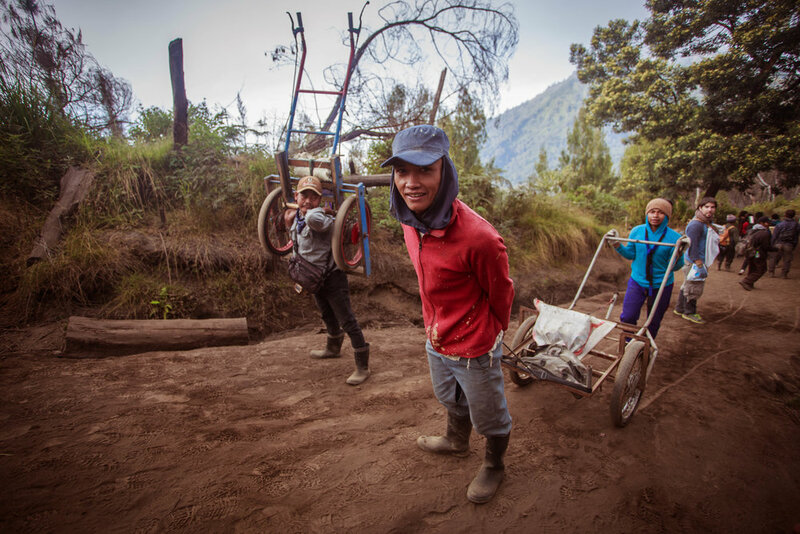 With daylight, we were also able to see many miners working their way up the mountain with baskets and wheelbarrows on their backs. 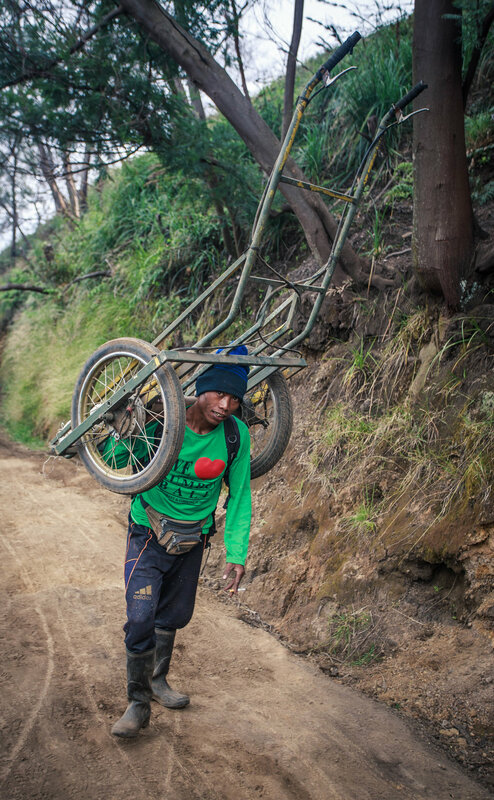 Because of the weight they carried on their shoulders on a daily basis, the permanent damage was very visible. Indentations were basically carved into their shoulders. 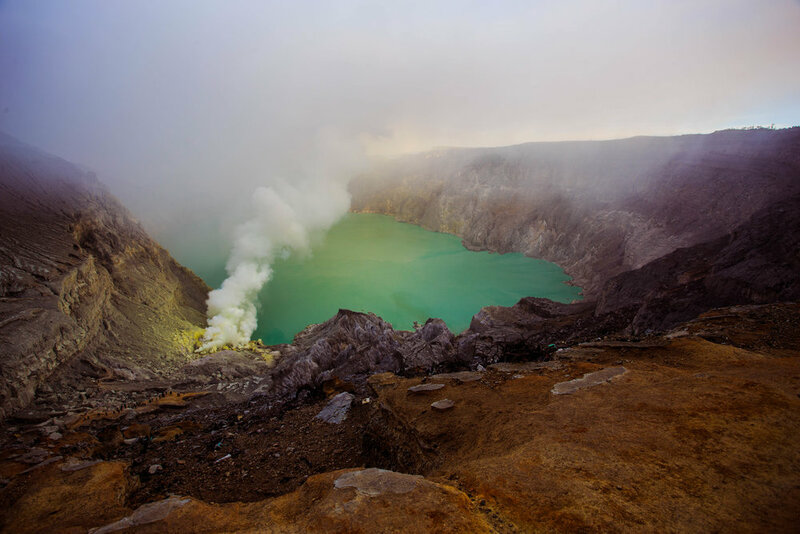 The lives they live just so people around the world can have sulfur in their daily products is frightening. I read somewhere that they made around 10 dollars per 80 kilo load. They really would make more money by becoming tour guides to the fire! 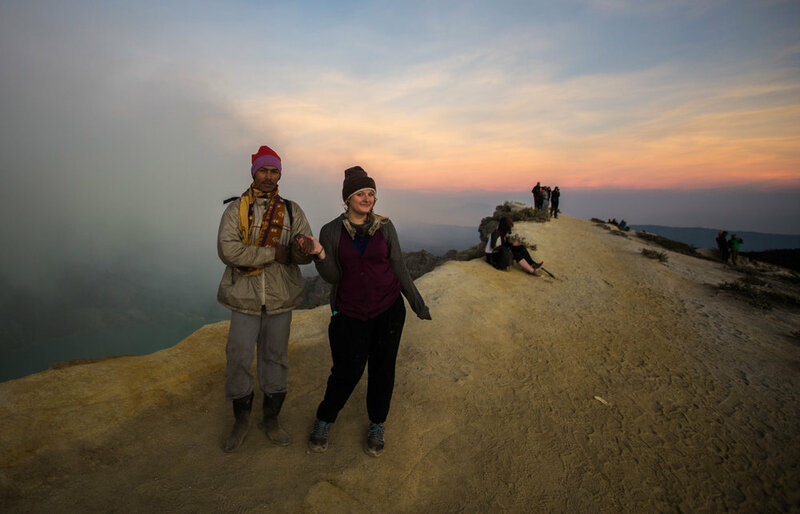 Anyways, Ijen was incredible, check out my shots.